Travaasa Hana, located on the eastern tip of Maui in the quaint town of Hana, offers guests an amazingly low-key Hawaiian experience. Far removed from the hustle and bustle of the resorts on Maui’s west coast, the tranquil surroundings of Travaasa Hana transport guests back to a gentler and more authentic era of Hawaii’s history. While the inn has expanded and changed hands several times over the decades, Travaasa Hana continues Fagan’s vision as a first-class resort where guests can experience the beauty and hospitality of one of Maui’s last true Hawaiian places. 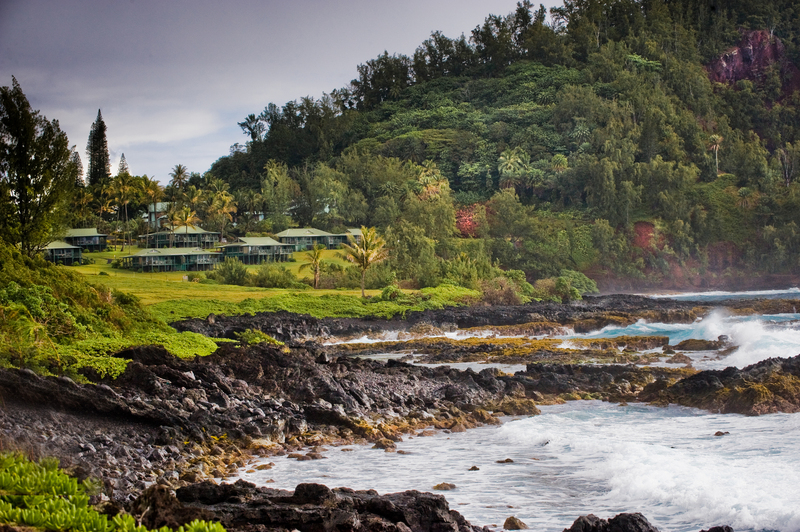 Geographically, Hana is bookended by spectacular tropical wilderness. To the north and west lies the famous Hana Highway, or Road to Hana, where each bend of the journey reveals ravines draped in waterfalls and lush rainforest. To the south and west, the road continues to the outskirts of Haleakala National Park, where Ohe ‘o Gulch tumbles to the ocean. My journey to Travaasa Hana involved a long day’s journey over the Hana Highway. Being a photographer, I didn’t want to miss a single waterfall, rainbow, or historical stop along the way, so I rented a car. For those who don’t want to drive, Mokulele Airlines operates daily flights from Kahului Airport in Maui, offering spectacular aerial views during the 20-minute fight. The minute I arrive at Travaasa, I’m greeted with a cool scented towel and a traditional glass of Pog (guava, passionfruit and orange juice). I’m delivered via golf-cart (the only mode of transportation on the resort property) to my Sea Ranch Cottage. These spacious, plantation-style accommodations offer a lanai with a private hot tub and a spectacular view of the Pacific Ocean. With no radio, clock, or TV, I plan to take advantage of this opportunity to really unplug and embrace the low-key vibe of Travaasa Hana. After the long drive, I’m looking forward to some pampering, so I head to the Travaasa Hana Spa where I’ve booked a traditional Hawaiian Lomilomi Massage. Literally translated, “lomilomi” is a powerful native Hawaiian healing tradition, meaning “to break apart.” The long, rhythmic massage strokes and deep kneading open the body and soothe the soul. As recommended, I arrive an hour before my scheduled service to enjoy the spectacular outdoor spa area. After changing into a cozy robe and sampling a glass of herbal tea, I head for the garden area overlooking Hana Bay. 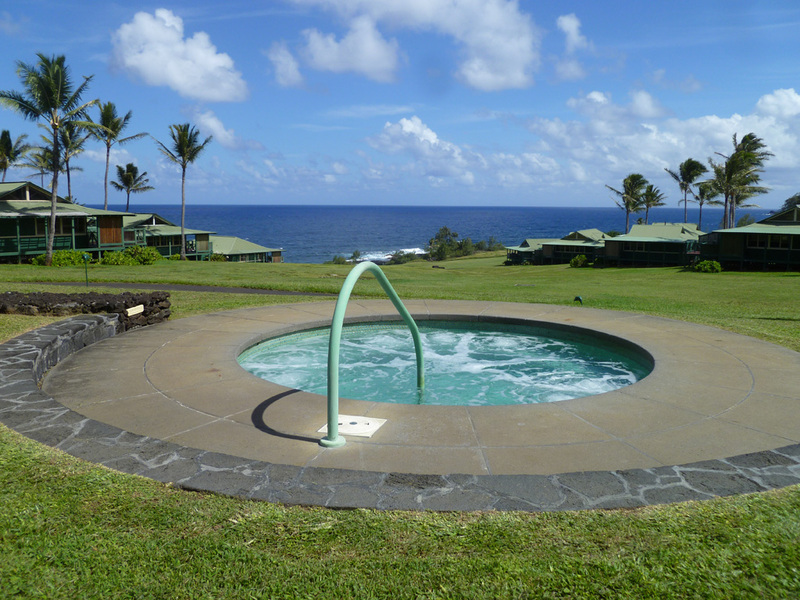 The large lava-rock whirlpool is so inviting and refreshing and after a long soak, I sink into the comfortable lounge chair and am almost lured asleep by the quietness of my surroundings. After my heavenly 60-minutes massage, I head back to my Sea Ranch Cottage to prepare for an evening of Hawaiian music and dinner at the award-winning Ka’uiki Restaurant. Using fresh local ingredients and combining flavors central to Hawaiian culture, executive Chef Villiarimo creates cuisine he describes as “Hana Fusion.” The menu is based on in-season, local ingredients and incorporates a combination of techniques from classical to innovative blending of bold flavors. In addition to signature local dishes, the restaurant offers gourmet vegetarian and vegan foods. At dinner, guests are invited to select from the Chef Tasting Menu or the Al la Carte Menu. Tonight, I’m in the mood for seafood, so I select the Pan Seared Diver Scallops with Corn Puree, Tomato Relish, and Kawari Sprouts with a Balsamic Drizzle as my appetizer (only 357 calories—which is noted on the menu!). Next, I select the Mixed Baby Greens with roasted Macadamia Nuts, Kula Cucumber, Heirloom Tomato, Tahitian Lime, Extra Virgin Olive Oil and Hawaiian Sea Salt (174 calories). For the main course, I choose the Grass Fed Beef Filet & Wild Pacific Shrimp with Kula Asparagus, Hamakua Mushroom—Red Wine Syrup & Compound Herb Butter (465 calories). The freshness of the ingredients and combination of flavors make this one of my top dining experiences during my trip to Maui! Deciding on tomorrow’s schedule is easy with the nightly print out delivered to my room. Guests are invited to select from five different pathways: Adventure, Culinary, Culture, Fitness and Spa & Wellness. So many choices; so little time! 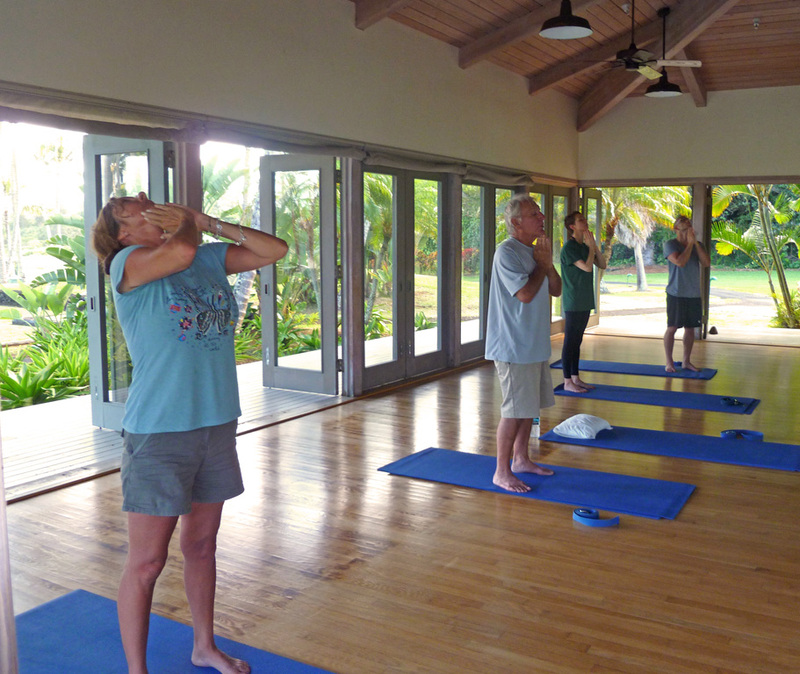 Offerings include everything from yoga & fitness boot camps, horseback riding, hiking, hula and ukulele lessons, throw net fishing, fruit tasting tours, etc. Several off-property tours to explore the local area can also be arranged through Travaasa Hana. A few of the most popular include the Ka’eleku Caverns in Hana, Ono Organic Farms, and Kahanu Gardens. 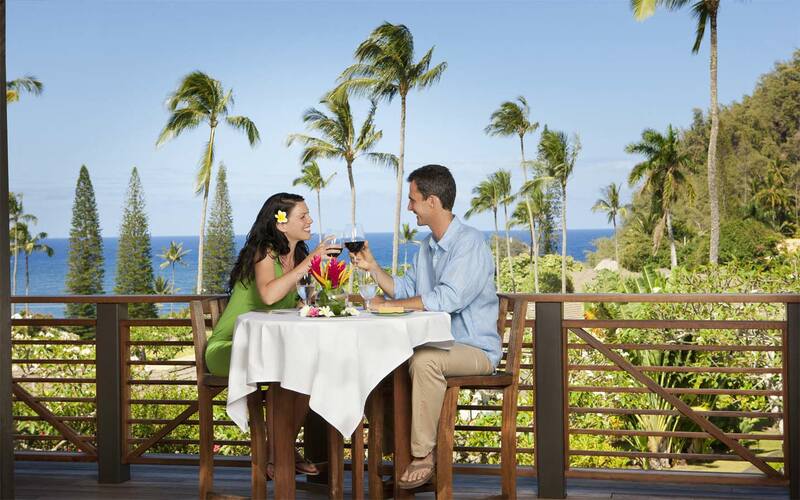 Travaasa Hana also offers a shuttle service and private lounge and changing facilities at Hamoa Beach. I decide to begin with an early morning yoga stretch class and then a dip in the infinity edge pool and relax in one of the hammocks tied between the palm trees. 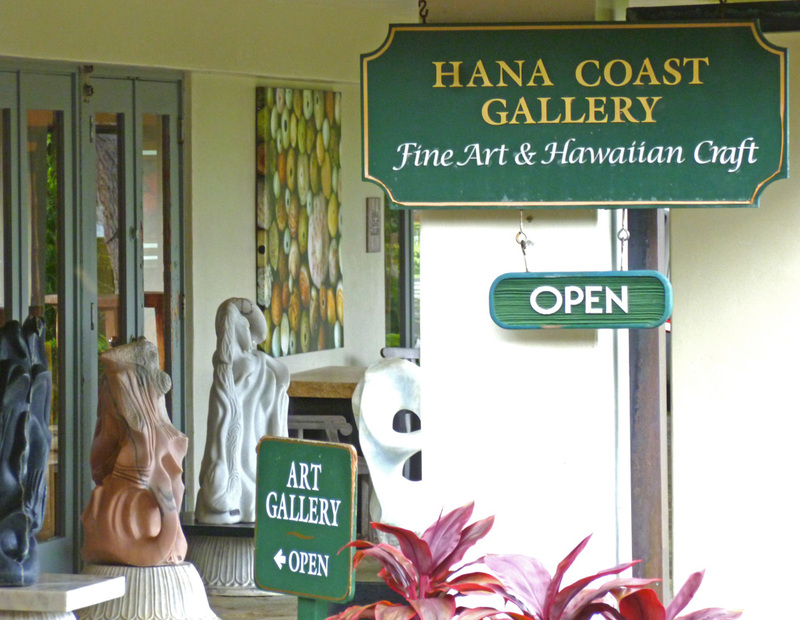 I then visit the Hana Coast Gallery located on the property at Travaasa Hana. This unique gallery features a large collection of native cultural art and decorative collections from the Hawaiian Islands and Pacific Rim. After lunch, I opt for a private tour of Kahanu Gardens. With 472 acres, the garden is the largest known collection of breadfruit cultivars. Also on the grounds is Pi’ilanihale Heiau, the world’s largest stone “heiau,” or ancient temple of worship. Returning to Travaasa Hana, I get a glimpse of one of Maui’s famous black sand beaches. After another amazing dinner at Ka’uiki Restaurant, I return to my cottage where I catch a whiff of a plumeria flower that has been placed on my bedside stand along with a postcard size relaxation card that encourages me to take 10 minutes for meditation before bed. As I slip beneath the organic linens on my bamboo platform bed, I feel the gentle trade winds blow through the cottage and soon the nightly tropical rain showers lure me to sleep. Tonight, I’m privileged to enjoy yet another night in an idyllic time and place far removed from the hustle and bustle of the world I left behind. 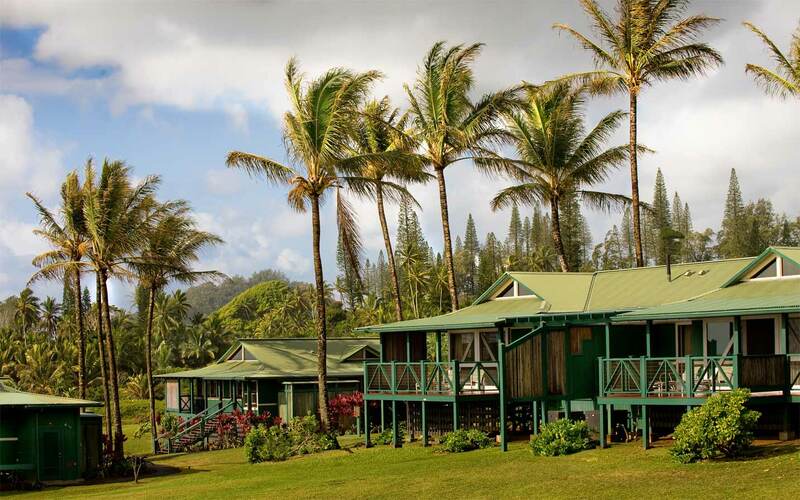 Travassa Hana, a AAA Four Diamond property, was voted #1 Resort in Hawaii in Conde Nast Traveller’s 2011 Reader’s Choice Award. The Spa at Travaasa Hana was also voted the #1 Resort Spa in Hawaii in Code Nast Traveller’s 2012 Reader’s Choice Award. With a three-night “all-inclusive” stay, Travaasa Hana offers free airfare from Kahului Airport in Maui to Hana Airport via Mokulele Airlines. For more information call 1-855-868-7282.